For the sake of completeness and not to have to revinvent the wheel so to speak, I want to quote the relevant sections from The Connoisseur’s Book of Japanese Swords along this chapter. And allow me for a better readability, if I may, to work these quotes into the sections below without strictly highlighting them as quotes. Thank you for the understanding. chōji (丁子) – Lit. “clove(s).” Elements of a hamon which resemble cloves, with a round upper part (the tassel or fusa, 房) and a narrow constricted lower part. There are many different chōji interpretations. See also ko-chōji, ō-chōji, jūka-chōji, saka-chōji, and kawazu-no-ko chōji. Is the entire hamon composed of chōji elements, we also speak of a chōjiba (丁子刃), or when it consists mainly of a mix of chōji and midare elements chōji-midare (丁子乱れ) accordingly. The chôji, or to be precise the chôjiba, was the most prominent feature of the Bizen tradition (regardless of if by kotô or if by later shintô and shinshintô smiths who worked in this tradition) but chôji elements are seen at many other schools and smiths, for example also at the Yamashiro and Sôshû tradition. chū-suguha (中直刃) – Medium width suguha. Fujimi-Saigyō (富士見西行) – A picturesque hamon interpretation that alludes to the Heian poet Saigyō (西行, 1118-1190) looking at Mt. Fuji. Saigyō was famous for admiring nature in his works. A Fujimi-Saigyô feature is not that obvious and often overlooked. So you have to spot first a relative largely protruding, rather isolated element, and if it looks like Mt. Fuji see if, after a certain distance, a smaller double-protrusion occurs. Is that the case, you probably have a Fujimi-Saigyô feature which brings you right away to early shintô and the Mishina school and the Yoshimichi (吉道) smiths in particular. But it can also be seen at Ôsaka-shintô works like at Kawachi no Kami Kunisuke (河内守国助) for example. fukuro-chōji (袋丁子) – Bag/pouch (fukuro) shape chōji. Typically seen at Fukuoka-Ichimonji or Katayama-Ichimonji works, at Osafune Mitsutada (光忠), but also at shintô-era Fukuoka-Ishidô smiths like Koretsugu (是次) and Moritsugu (守次). gunome (互の目) – Lit. “reciprocal eyes/elements.” A series of waves that look like similarly-sized semicircles. Depending on its size, this hamon pattern is referred to as ō-gunome (大互の目, large gunome) or ko-gunome (小互の目, small gunome) but there are more variants of this hamon interpretation referred to by their shapes. Mix forms are described as gunome-chōji (互の目丁子), gunome mixed with chōji, and gunome-midare (互の目乱れ), gunome mixed with midare, for example. hakoba (箱刃) – A hamon which consists basically just of box shaped elements. Angular elements are often seen at the Sengo (千子) (Muramasa [村正], Masashige [正重]), the Sue-Seki (Kanesada [兼定], Kanefusa [兼房], Ujifusa [氏房]), and the Shimada (島田) school and in shintô times for example at the Kashû smiths Kanewaka (兼若) and Takahira (高平), at Masanori (正則), and at the Mizuta (水田) school. And to a cetain extant some angular approach is also seen at Yamato no Kami Yasusada (大和守安定). hako-midare (箱乱れ) – Hamon interpretation mixed with of consisting of more or less regular box shaped elements. hiro-suguha (広直刃) – Wide suguha. Usually this term is used in the case the suguha is a third or more in width in relation to the mihaba of the blade. hitatsura (皆焼) – Lit. “all/everything hardened.” Gunome-midare, notare-midare, or other mix of undulating hamon elements with plentiful tobiyaki scattered throughout the blade, mostly also combined with muneyaki. This hamon interpretation goes back to Sōshū smiths of the Nanbokuchō period but was later applied by smiths all over the country. hoso-suguha (細直刃) – Narrow suguha. hyōtan-ba (瓢箪刃) – Lit. “gourd ha.” A hamon which reminds of a more or less regular arrangement of gourd halves. This interpretation is especially typical for Kotetsu (虎徹) and the smiths in his vicinity. ito-suguha (糸直刃) – Lit. “thread suguha.” Very thin suguha. jūka-chōji (重花丁子) – Lit. “overlapping flowers.” Gorgeous multiple, overlapping chōji. juzu-ba (数珠刃) – A hamon of regular and uniform, roundish gunome which reminds of a Buddhist rosary (juzu, 数珠). This interpretation is especially typical for Kotetsu (虎徹) and the smiths in his vicinity. kataochi-gunome (片落ち互の目) – A gunome with uniformly straight yakigashira but where each element slants towards the valley. As this hamon reminds of sawtooth pattern (nokogiri), the interpretation is also referred to as nokogiri-ba (鋸刃). It is said that the kataochi-gunome was introduced by Kagemitsu (景光) but hints of this hamon can already be seen on certain works of his predecessor Nagamitsu (長光). kawazu-no-ko chōji (蛙子丁子) – Lit. “tadpole chōji.” A mush-room-shaped chōji with a long neck which reminds of tadpoles. This chōji interpretation is especially typical for Osafune Mitsutada (光忠), Hatakeda Moriie (守家), and Kamakura-Ichimonji Sukezane (助真). kikusui-ba (菊水刃) – Picturesque hamon interpretation with chrysanthemum-shaped elements above the habuchi which reminds of the kikusui subject, i.e. chrysanthemums floating down on a stream. A kikusui-ba is a actually variant of the sudareba so you are in the vicinity of the Mishina Yoshimichi (吉道) smiths when facing a kikusui-ba. kobushigata-chōji (拳形丁子) – Lit. “first-shaped chōji.” A chōji-midare interpretation introduced by the second generation Kawachi no Kami Kunisuke (河内守国助) which reminds of clenched fists. But precursorsof this style of hamon can also be seen at Sue-Bizen Katsumitsu (勝光) and Sukesada (祐定) and at the Taira-Takada school. ko-chōji (小丁子) – Small chōji. ko-gunome (小互の目) – Small gunome. ko-midare (小乱れ) – Small midare. ko-notare (小湾れ) – Small notare. koshi-no-hiraita (腰の開いた) – Term for hamon elements that widen towards their base. Usually seen on midare and gunome formations, thus also koshi-no-hiraita midare for example. Koshi-no-hiraita is typically seen at the Sue-Bizen school (Norimitsu [則光], Katsumitsu [勝光], Munemitsu [宗光], Sukesada [祐定], Kiyomitsu [清光], Harumitsu [春光]), the Uda (宇多) school, the Kanabô (金房) school, at Kashû Kiyomitsu (加州清光), Hôki Hiroyoshi (広賀), and the Takada (高田) school. In shintô times at Ishidô Tameyasu (石堂為康), Tatara Nagayuki (多々良長幸), and the Sukesada (祐定) smiths of that era, and in shinshintô times at Taikei Naotane (直胤), Koyama Munetsugu (宗次), Tsunatoshi (綱俊), and at Gassan Sadayoshi (貞吉) and Sadakazu (貞一). midareba (乱れ刃) – Irregular hamon pattern which comes in many varieties. midare-chōji (乱れ丁子) – Midare mixed with chōji. mimigata (耳形) – Ear-shaped hamon pattern mostly seen on swords by Osafune Chōgi (長義). Also referred to as mimigata no gunome (耳形互の目) or mimigata-ha (耳形の刃). notare (湾れ) – An undulating hamon pattern of gentle waves. We further differentiate between ō-notare (大湾れ, large notare) and ko-notare (小湾れ, small notare), depending on the amplitude of the waves. A hamon that is entirely composed of notare waves is also referred to as notare-ba (湾れ刃). Incidentally, a shallow notare with not that high waves is referred to as asai-notare (浅い湾れ). A notare is seen after the end of the Kamakura period, mainly on blades of Sôshû-province schools and their related schools. For the kotô era for example at: Sôshû Sadamune (相州貞宗), Nobukuni (信国), Rai Tomokuni (来倫国), the Kanemitsu (兼光) school (Kanemitsu II [二代兼光], Tomomitsu [倫光], Masamitsu [政光], Yoshikage [義景]), Ômiya Morikage (大宮盛景), the Kozori (小反) school, the Samonji (左文字) school, etc., and for the shintô era for example at: Yasutsugu (康継), Kotetsu (虎徹), Okimasa (興正), Yamato no Kami Yasusada (大和守安定), Yasutomo (安倫), Masatsune (政常), Teruhiro (輝広), Hizen Tadayoshi (肥前忠吉), Yasuyo (安代), etc. ōbusa-chōji (大房丁子) – Lit. “large-tassel chōji.” As the name suggests, a chōji with noticeably large tassels which makes the elements sometims almost tend to gunome. ō-gunome (大互の目) – Large gunome. ō-midare (大乱れ) – Large dimensioned midare. ō-notare (大湾れ) – Large notare. <Kotô> Heianjô Nagayoshi (平安城長吉), the Sue-Bizen school (Norimitsu [則光], Sukesada [祐定], Kiyomitsu [祐定]), Izumi no Kami Kanesada (和泉守兼定), Ujifusa (氏房), Muramasa (村正), Tsunahiro (綱広), Fuyuhiro (冬広), the Shimada (島田) school, the Uda (宇多) school, etc. <Shintô> Myôju (明寿), the Horikawa (堀川) school, Masatoshi (正俊), Shinkai (真改), Echizen no Kami Sukehiro (越前守助広), Ômi no Kami Sukenao (近江守助直), Shigekuni (重国), Yasutsugu (康継), Yasusada (安定), Sadakuni (貞国), Masatsune (政常), Nobutaka (信高), Daidô (大道), Teruhiro (輝広), the Tadayoshi (忠吉) school, etc. saka-chōji (逆丁子) – Slanting chōji. <Kotô> The Katayama Ichimonji (片山一文字) school, the Chû-Aoe school (Tsugunao [次直], Tsuguyoshi [次吉], Moritsugu [守次]), etc. Niji Kunitoshi (二字国俊) also sometimes mixed this into his hamon. <Shintô> The Fukuoka Ishidô (福岡石堂) school, the Kishû Ishidô (紀州石堂) school, etc. <Shinshintô> Naotane (直胤), Tsunatoshi (綱俊), Munetsugu (宗次), Tomotaka (朝尊), Sadakazu (貞一), etc. saka-gunome (逆互の目) – Slanting gunome. saka-midare (逆乱れ) – Slanting midare. sanbonsugi (三本杉) – Lit. “three cedars.” Hamon interpretation of groups of three pointed togari mostly seen on works of the Kanemoto school (兼元) of Mino. Also referred to s sanken-ba (三間刃, lit. “three-interval ha”). sudareba (簾刃) – Lit. “bamboo blind ha.” A sudareba is based on suguha or a shallow notare. The pattern seen inside the hamon looks like a bamboo blind. This hamon interpretation was introduced by Tanba no Kami Yoshimichi (丹波守吉道) and applied by his successors and other smiths in his vicinity. suguha (直刃) – Generic term for a straight hamon. Well, a suguha was applied by almost any school and smith, even from time to time by those who were usually working in chôji for example. But we can see more or less obvious differences of course. First of all, one has to check if the hardening bases on nioi or on nie, that can help a lot in differentiating a suguha. A nioi-based suguha is more associated with the Bizen and Mino tradition and a nie-based suguha more with the Yamashiro and Yamato tradition. Due to the fact that a suguha can be virtually found at the school and smith as indicated, it is hard to provide here a definite kantei “checklist.” Suguha is the most popular type of hamon, seen in blades from every province and every period. It was especially popular with smiths of the Yamashiro and Yamato traditions. Leading swordsmith: <Kotô> The Awataguchi (粟田口) school produces abundant nie, with a narrow hamon; hoso-suguha is relatively often seen in the tantô. Rai (来) school (Kunitoshi [国俊], Kunimitsu [国光], Kunitsugu [国次], Kunizane [国真]) blades exhibit chû-suguha mixed with ko-midare. In Yamato-province schools, vertical hataraki, such as hakikake, nijûba, and kuichigaiba, appear in the hamon. Bizen-province schools basically tempered in nioi-deki. Sôshû-province schools produced abundant nie at the end of the Kamakura period, while the Sue-Sôshû school was inclined toward nioi-deki. In addition, suguha is often seen in blades of the Mino-province schools, Muramasa (村正), the Shimada (島田) school, the Uda (宇多) school, the Momokawa (桃川) school, the Mihara (三原) school, and the Enjû (延寿) school. Less hataraki tends to be seen in the hamon of blades produced in later periods. <Shintô> Suguha tempered in nie-deki is seen in the work of the most famous swordsmiths (for instance, in tantô by Myôju [明寿] and work by the Horikawa [堀川] school, Kotetsu [虎徹], Yasutsugu [康継], etc.). Sukehiro [助広] produced abundant ko-nie. Shinkai (真改) created larger nie with a pattern that undulates slightly. The Tadayoshi (忠吉) school temperd in a chû-suguha that is uniform in width from top to bottom. Shigekuni (重国) tempered in nijûba in the monouchi area. In blades by Kunikane (国包), hakikake is seen along the habuchi. A suguha in nie-deki is often seen at the following schools and smiths: <Kotô> The Awataguchi (粟田口) school (Kuniyoshi [国吉], Yoshimitsu [吉光]), the Rai (来) school (Kunitoshi [国俊], Kunimitsu [国光], Mitsukane [光包], Kunizane [国真], Kuninaga [国長], Ryôkai [了戒]), the Tegai (手掻) school, the Hoshô (保昌) school, the Senju’in (千手院) school, the Taima (当麻) school, the Shikkake (尻懸) school, the Shintôgo (新藤五) school (Kunimitsu [国光], Kunihiro [国広]), Yukimitsu (行光), the Shimada (島田) school, the Ko-Aoe school (Yoshitsugu [吉次], Tsunetsugu [恒次], Suketsugu [助次]), the Ko-Mihara school,. the Ko-Niô (古二王) school, Kagenaga (景長), the Miike (三池) school, the Enjû (延寿) school (Kunimura [国村], Kunitoki [国時], Kuniyasu [国康], Kunisuke [国資]), the Naminohira (波平) school, etc. <Shintô> Myôju (波平), the Horikawa (堀川) school, Shinkai (真改), Sukehiro II (二代助広), Shigekuni (重国), Yasutsugu (康継), Ogasawara Nagamune (小笠原長旨), Kunikane (国包), Yamashiro no Kami Kunikiyo (山城守国清), the Tadayoshi (忠吉) school, Yasuyo (安代), Naminohira Yasuchika (波平安周), etc. <Shinshintô> Masahide (正秀), Naotane (直胤), Kiyondo (清人), Norikatsu (徳勝), Sadakazu (貞一), Aizu Kanesada (会津兼定), Sa Yukihide (左行秀), etc. A suguha in nioi-deki is often seen at the following schools and smiths: <Kotô> Osafune (長船) school (Nagamitsu II [二代長光], Kagemitsu [景光], Sanenaga [真長], Kagemasa [景政], Chikakage [近景]), the Ôei-Bizen (応永備前) school (Morimitsu [盛光], Yasumitsu [康光]), The Sue-Bizen school (Norimitsu [則光], Tadamitsu [忠光], Sukesada [祐定], Kiyomitsu [清光]), the Ukai (鵜飼) school, the Chû-Aoe school (Tsugunao [次直], Tsuguyoshi [次吉], Moritsugu [盛次]), the Sue-Tegai (末手掻) school, Zenjô Kaneyoshi (善定兼吉), the Sue-Seki school (Kanesada [兼定], Kaneyoshi [兼吉], Kanetsune [兼常]), the Sue-Mihara school, the Sue-Niô school, etc. Suguha with wide nioiguchi: <Kotô> Gô Yoshihiro (郷義弘), etc. Very rare in Kotô blades. <Shintô> Shinkai (真改), Sukehiro II (二代助広), Sukenao (助直), Tadatsuna II (二代忠綱), the Tadayoshi (忠吉) school. <Shinshintô> Yukihide (行秀), etc. Suguha with hazy (and subdued) nioiguchi: <Kotô> Bungo Yukihira (豊後行平), the Gassan school, the Hôju (宝寿) school, Sairen (西蓮), Jitsu’a (実阿), the Naminohira school, etc. Also found on blades of local swordsmiths. suguha-hotsure (直刃ほつれ・直刃解れ) – Suguha with a noticeable amount of hotsure which make is look like a frayed piece of cloth. togari (尖り) – Prefix for any kind of pointed hamon element. For example a togari-gunome consists of gunome which are noticeably pointed. Togari is a common feature of Sue-Seki blades. A hamon that is entirely composed of togari elements is referred to as togari-ba. tōranba (濤瀾乱刃) – Lit. 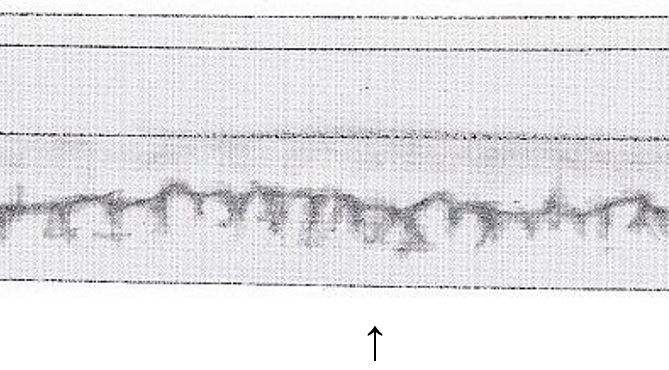 “ha in the form of large surging waves.” This hamon interpretation is said to go back to Echizen no Kami Sukehiro (越前守助広) and was later favored by certain Ōsaka-shintō smiths. It was then later revived by some shinshintō smiths. It is occasionally accompanied by tama which remind of spray. uma-no-ha midare (馬の歯乱れ) – A hamon interpretation that consists of regular large gunome and/or midare elements which remind of horse teeth (uma-ha or uma no ha) and which is usually associated with the Sôshû tradition. In kotô times it is for example seen at the Masamune (正宗) school (Yukimitsu [行光], Masamune [正宗], Hiromitsu [広光], Akihiro [秋広]), Gô Yoshihiro (郷義弘), Norishige (則重), Shizu Kaneuji (志津兼氏), the Hasebe (長谷部) school, etc. In shintô times at Echizen Yasutsugu (越前康継), Hankei (繁慶), Okimasa (興正), Kunihiro (国広), Kunimichi (国路), the Mizuta (水田) school, Mondo no Shô Masakiyo (主水正正清), etc. And in shinshintô times at the Kiyomaro (清麿) school, Oku Motohira (元平), etc. yahazu (矢筈) – Forked or dove-tail shaped midare elements that resemble arrow notches (yahazu). This interpretation is often seen on Mino swords. A special variant of just half dove-tail shaped elements is known as kata-yahazuba (片矢筈刃) or short kata-yahazu (see picture below bottom) and is a characteristic feature of Higashiyama Yoshihira (東山美平). A hamon which is mostly composed of yahazu elements is called yahazu-ba (矢筈刃). <Kotô> The Sue-Seki school (Kanesada [兼定], Kanetsune [兼常]), Muramasa (村正), Heianjô Nagayoshi (平安城長吉), Tsunahiro (綱広), etc. <Shintô> The Echizen Seki school, Kanewaka (兼若), Nobutaka (信高), Teruhiro (輝広), etc. First paragraph Markus, there is a typo. it is not “reinvent the weel” but “the wheel”, the “h” has dropped.. Many Thanks again for the series- could I ask a favour- could you please send me KANTEI 1 – SUGATA #5 as I don’t appear to have it.